Amplitude's grand strategy series returns to the stars. Gorgeous grand strategy with atmosphere, depth and replayability—but it needs more time to reach its potential. What is it? 4X space strategy with diverse factions. Endless Space 2's journey is just beginning. The lifecycle of a 4X strategy game starts, if you're lucky, with a promising set of foundations. After six months in Steam Early Access, Amplitude's stylish game of galactic conquest enters a competitive field with much to distinguish it. It isn't the broadest or the deepest space strategy game available right now, but it is perhaps the most pleasant to spend time with: an atmospheric afternoon-killer that blends strategic decision-making with beautiful presentation. It really is gorgeous. There's a sense of style here that'll appeal to anybody who loves the fantasy of a 4X strategy game but typically finds the presentation dry. Amplitude knows when a bit of flair is necessary to push through the sense that you're really setting down on alien worlds or trading fire with an enemy fleet, even what you're really doing is engaging with a series of complicated nested menus. A huge amount of phenomenal artwork, much of it faction-specific, accompanies quests, dynamic events, upgrade trees, and so on. Atmospheric short cutscenes accompany colonisation and each battle can be viewed with a well-implemented 3D spectator system. There's even a bit of dramatic cinematography when you zoom in on a newly-discovered star system for the first time. All of this is, thankfully, completely skippable if you want to get back to the meat of the game—but all of it is very welcome too. Endless Space 2's soundtrack is great too, as is much of its writing. Each of its eight factions is meaningfully differentiated not just in how they play, but in the attitudes and themes expressed through their background and the questlines that accompany each. There is a militaristic human faction, but it's hard to get excited about them when your alternatives include pacifistic space treants, time-bending robot refugees from a different universe, or a race made up of clones of a single extremely vain man. Each race engages in some way with a mysterious substance called Dust and a vanished race called the Endless, which ties them into the history of not just this game but its predecessors—including Endless Legend, the fantasy spinoff. The races are sufficiently different that there isn't really a 'default' way to play: at its core this is a game about managing resources, research and fleets to expand your fledgling empire beyond its initial star system to places beyond. The landscape of the generated galaxy you occupy has the potential to steer your progress, encouraging you to invest in particular tech pathways to make the most of that resource-rich but uninhabitable (for now) volcano world in your home system, or prompting you to build up a defensive force to pacify a nearby minor empire. You can begin an Endless Space 2 game with a plan—victory conditions fit the traditional pattern of conquest, economy, research and industry—but that plan tends to be shaped by the type of galaxy you find yourself in, and that's before we get to the differences between the factions themselves. For example: a majority of factions found a new colony by building a colony ship, sending it to a viable world, and founding an outpost. This outpost then receives civilian transports from nearby worlds, and if enough of these make it to the world then the world becomes a colony. Civilians can be intercepted, blockaded, coerced and destroyed, turning colonisation into a race between rivals. Yet other factions do it completely differently. The robotic Riftborn found an outpost in much the same way, but their people are built rather than born so they're less dependant on civilian transports. The nomadic Vodyani colonise instantly through the use of vast ark ships that take time to produce and whose loss can be catastrophic. The Unfallen, pacifistic tree-people taking to the stars for the first time, extend cosmic 'roots' down the starlanes between worlds that allow them to colonise new worlds for 'free' as long as their branching growth isn't hindered by an enemy. Each of my four playthroughs to date has felt meaningfully different as a result of this variety. 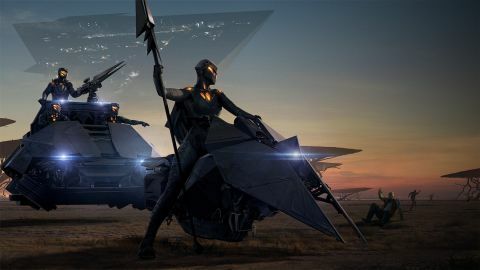 At its core, Endless Space 2 is a pretty traditional 4X game—perhaps too much so, in that if you're familiar with the genre there's little to surprise you about the game's basic structure. Amplitude's skill, however, is in ensuring that you never interact with the game at that level without encountering some other complicating factor arising from your faction or situation. These are qualities that emerge with time, however. I found Endless Space 2 a little harder to get into than its rivals as a consequence of a UI that might be too efficient for its own good. Amplitude's design sensibility has resulted in an interface that is slick, good-looking, and, when you're familiar with the game, quick to use and parse. However it achieves this through the extensive use of shorthand and symbols, and while there are info-dump tutorial pop-ups to help you out, my first hundred turns or so were spent making mistakes simply because I couldn't tell what the UI was trying to tell me. Those frustrating early hours have the potential to put players off, although perseverance is definitely rewarded. Not all of Endless Space 2's systems are created equal, however. While the factions themselves are well-realised, I found heroes—evolving special characters that can be assigned to planets or fleets—less impactful. These faction-agnostic wanderers emerge from a space station called the Academy that is placed randomly on the map and has its own plot arc, developed over the course of a plot chain. However heroes themselves lack personality: they share a pool of generic ships, and while they can provide some handy combat buffs I found them primarily useful as install-and-forget colony-boosters. More successful is the political system, which changes the balance of parties within your faction in response to your strategic decisions. Parties, in turn, give you access to laws: extra buffs that can help a great deal as long as your aims align with those of the powers that be. Although I didn't find it particularly hard to make sure that my chosen party retained control—through fair means and foul—the rise of secondary parties as the result of, say, an unexpected war provided meaningful late-game twists. Diplomacy with the AI is less successful. You have to really commit to a diplomatic approach if you want access to meaty negotiation options like alliances, and AI factions themselves very rarely approach you with anything other than a 'get out of my territory' bark or the suggestion that they might be up for a trade deal. Although I had a strong sense of my own civilisation, I can't say that the AI ever manifested a personality beyond the top-level traits of their faction. Endless Space 2's ship building and combat systems are strengths, however. After two campaigns spent pursuing a peaceful victory, I opted for aggression on my third. As the Vodyani, I ended up in a protracted early conflict with the Cravers, insect cyborgs that like to eat people. Our first dramatic pitched battle took place above the Academy, which the Cravers controlled—and which is depicted in dramatic fashion in the combat viewer. The Craver ships were geared entirely for short range combat, while I had taken a more versatile approach. Specialisation paid off for the enemy in our first engagement, and I was forced to withdraw. I changed my strategy, opting for a tactic that allowed me to send one flotilla down the middle at close range while keeping my other at a distance. Then I redesigned my attack ships with long-range lasers and my defensive ships with heavy armour plating to protect them from Craver guns. I sent the fleets back in, offering the defensive ships to the enemy as a distraction while my long-range guns took them apart. Despite our fleet sizes being roughly equivalent to those of our first battle, new tactics turned this second encounter into a decisive victory for me. This is a real positive in a genre where war too often comes down to the size of your army, not its composition. The fact that it looks so dramatic—angular attack ships trading fire against huge planetary backdrops—is a bonus. Although Endless Space 2 will inevitably be a heavily patched and expanded-upon game, it definitely needs polish and refinement. A launch-day update solved lots of the most serious issues hanging over from the game's time in Early Access, but there's still a laundry list of known bugs for Amplitude to work through. While some of these are edge-case glitches that only affect players in certain situations, more serious problems with the game getting stuck during the end turn sequence and broken saves persist. That Amplitude is aware of the problems is reassuring, but doesn't necessarily offer much comfort to the player who can't make progress because of a bug. Endless Space 2 is a good game, but there's no getting around the fact that it'll be a better game in six months. That is ever the case for 4X strategy games, of course, but you'd be forgiven for waiting until that list of known issues is a little shorter. Update: Another round of patch notes includes fixes for two issues cited here, 'getting stuck during the end turn sequence' and 'broken saves.' We have not verified these fixes, but they were present in our build of the game.